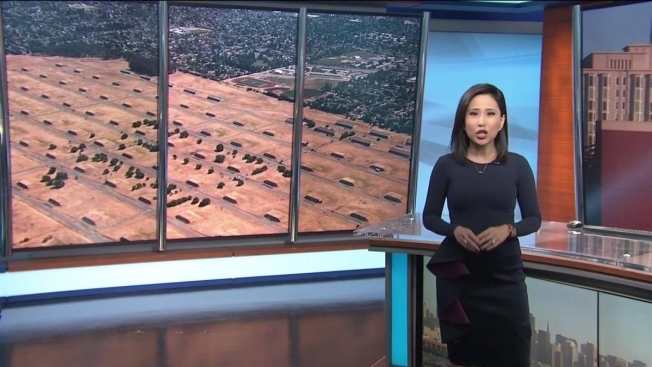 East Bay activists and elected officials are planning a town hall and a rally in response to the Trump administration's purported plans to place as many as 47,000 immigrants in a detention camp at the Naval Weapons Station just outside Concord. About 600 people are expected to show up for a rally and human billboard protesting the detention camp at 6 p.m. Thursday at the entrance to El Cerrito Plaza on San Pablo Avenue in El Cerrito, according to a member of El Cerrito Shows Up. "We will hold a human billboard action in which we will line up on San Pablo at the heart of commute time and hold up signs with messages," said Sherry Drobner, an organizer with El Cerrito Shows Up reached by telephone Saturday morning. 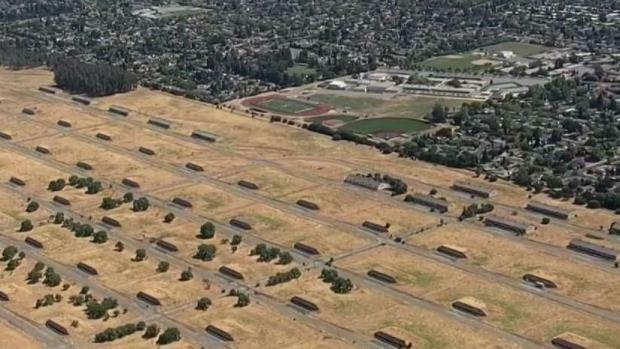 "This is comparable to the Japanese internment camps," Drobner said, linking the mass detention of immigrants to camps that existed in the Bay Area during World War II. "Our country apologized for those camps, so we already know this is wrong." El Cerrito Shows Up is a group of members of Indivisible East Bay and El Cerrito Progressives, Drobner said. The group holds rallies every Thursday at the entrance to the shopping plaza, drawing around 600 people. Drobner said the public is welcome to join the protest and people should make their own signs to bring if possible. "People coming to the border for asylum is not a criminal act. It's wrong to put them in jail," Drobner said. Rep. Mark DeSaulnier, D-Walnut Creek, will host a Facebook Live Town Hall Tuesday to discuss the proposed Concord detention facility, immigration and family separation, DeSaulnier said on Facebook. DeSaulnier described the town hall as an opportunity for the public to ask questions and "hear about what has been happening in the Republican-controlled Congress and administration on immigration policy." He described the policies being crafted by the Republican majority as "inhumane." 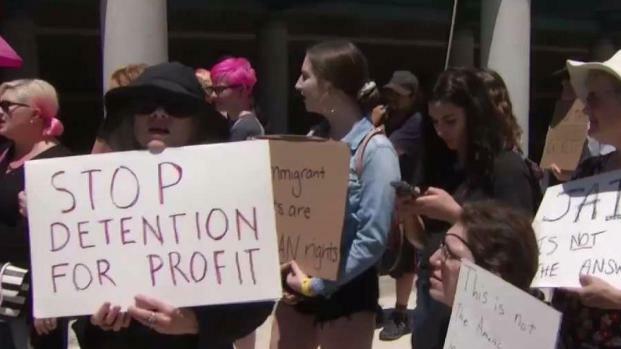 Dozens of people angered by President Trump's zero tolerance policy that has separated thousands of migrant parents children at the border protested outside the ICE detention facility in Richmond Friday afternoon. Jodi Hernandez reports. The city of Concord issued a statement on social media Friday afternoon saying city officials were "very concerned" to learn of today's news, and that the Navy has not yet communicated its intentions to the city. City officials are currently in negotiations to acquire the Naval Weapons Station but they do not have jurisdiction or control over the 12,800-acre property-which is listed by the U.S. Environmental Protection Agency as a "superfund site" due to the presence of hazardous materials such as arsenic, mercury and polychlorinated biphenyls (PCB's) in the soil and sediment. There may even by unexploded ordnance, or bombs, in an area used as an on-site landfill, according to the EPA. Current Contra Costa County Supervisor John Gioia, District 1, also weighed in on the matter on Twitter Friday. "That's crazy, we'll fight it and we won't let that happen!!!" Gioia said. The comments by local leaders came in response to national news reports, first appearing on Time magazine's website at time.com, that the Navy is preparing plans to build facilities to detain tens of thousands of immigrants and asylum seekers on military bases in California, Alabama and Arizona as part of the White House's "zero-tolerance policy" for undocumented immigrants. Navy public affairs did not immediately confirm the rumors about plans for a mass detention facility in the East Bay but Capt. Gregory Hicks, chief navy spokesman, did issue a statement Friday. "It would be inappropriate to discuss internal deliberative planning documents," Hicks said. A duty officer for the navy's public affairs office referred further questions to public affairs personnel for the Office of the Secretary of Defense. "The Department of Defense is conducting prudent planning and are looking at all available regions should (Department of Homeland Security) ask for assistance in housing adult illegal immigrants," Department of Defense spokesman Johnny Michael said in an email. "At this time there has been no request from DHS."